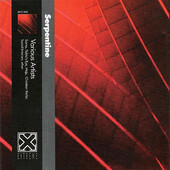 In the year of the snake, Serpentine arrives; a collection of music from new and current artists on Extreme. The tracks are both previously unreleased and from albums already available. This album is a statement about the music of Extreme and how, as a label, it continues to seek out the new and innovative music of the world, with Maju, Kiefer and Ether. It is also a sign of the continuing support Extreme has for artists such as Soma, Social Interiors and Pablo’s Eye. Extreme has always been a label hard to define in its musical style and this continues. Roger Richards, director of Extreme explains this simply in the statement; “The voice of the artist takes many forms”. From the melodious ambience of Maju to the roaring percussive rock music of Ether, it is always music that slips between the cracks of the mainstream that appears on Extreme. Soma deliver their filmic dub noir and Pablo’s Eye charm with their beautiful eloquence. Social Interiors provide an otherworldly soundscape and the folk western songs of Christian Kiefer are further testament to the challenging diversity of the label. What Extreme is not about is hard listening for the sake of hard listening, weird for the sake of weird or noise for the sake of noise. This is something that can be confusing with so many releases on Extreme from acclaimed noise musician Merzbow but Merzbow is unique as are the other artists on Extreme. So let Serpentine take you on a journey of discovery of the music of Extreme. It’s an intriguing experience. Musik Data by Pieter Bourke & David Thrussell. Previously unreleased. Written, performed, and produced by Christian Keifer. Administered by BMI. Previously unreleased. (Meditation – Ave Maria by Charles Gounod and J.S. Bach). Composed by Pablo’s Eye (2000) Produced by Axel Libeert & Erwin Autrique. Pablo’s Eye is Patrick Hanappier, Axel Libeert, Marie Mandi and Royo. Previously unreleased. Composed by Shane Fahey and Julian Knowles. Previously unreleased. c & p EXTREME 2001.